“​ENTRANCE​”, a group show highlighting seven emerging contemporary artists. Events > 2017 > July > “​ENTRANCE​”, a group show highlighting seven emerging contemporary artists. Gallery 38 is pleased to present “​ENTRANCE​”, a group show highlighting seven emerging contemporary artists. This show focuses on these artists interpretations of their entry into the art world. They unabashedly share their feelings, thoughts and emotions that go into creating their work not just for self, but also for public ridicule and consumption. While the members of this show come from diverse backgrounds, there are similarities that tie the works together. The work centers on interpretation of culture, society, identity and the complex connections that hold all of these constructs together. The work manifests itself in facets of paint, sculpture and interactive installations, all designed to use space, color and texture to invite meaningful conversations relating to contemporary issues. Focusing on their grassroots origins, “ENTRANCE” not only speaks to the artists taking a leap into the art market, but also using their work to realize and then share their identities, an entrance, for the viewer, into the artist’s inner selves. Interacting with surface abstractly, creating new reality along the way almost seamlessly without thought allows these artists to display an artistic courage that will allow the viewer to take a deeper look into each artist’s journey from past to present. Catherine Czerwinski, Robert Miller, Oogum LeftFoot, RendaWriter, Ebony Lewis, Jason Humphrey and Fur Fountains. Gallery 38 an ongoing project by ArtAboveReality and Bancs Media, opened it’s doors in March of 2015 with the hopes of starting a artistic renaissance in the West Adams neighborhood. Named in a LA Weekly article as “The Center of the burgeoning West Adams Art Scene”, Gallery 38 has done over 15 solo exhibitions and art fairs and has been able to continue the tradition of presenting emerging and established artists while focusing on developing the community around them. 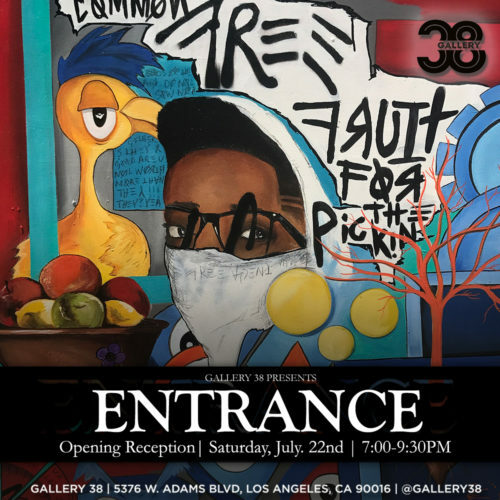 Gallery 38 is a creative space and art gallery in Los Angeles brought to you by ArtAboveReality and Bancs Media.